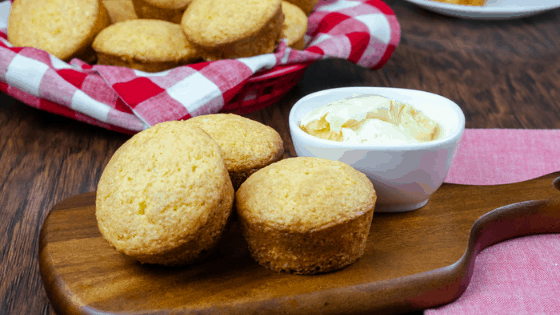 These sweet cornbread muffins Timberwood Grill Copycat is made using a cake mix and cornbread mix to create a smooth texture and a sweet flavor. I’m not going to lie, I’m not a huge fan of cornbread because I’m not a fan of gritty textures. I quickly turn down cornbread in restaurants or during family dinners for this reason. Recently, while on vacation, we ate at the Timberwood Grill in Pigeon Forge, Tennessee and I took one bite of their cornbread and absolutely loved it. It had a smooth, not gritty texture and the flavor was sweeter than other cornbreads I have tried. My husband asked our waiter what made the cornbread so good and he told us the trick was adding cake mix – brilliant! Within a few days of coming back from vacation, I was working on making a copycat for their cornbread! I will say, I added less butter than they added in their recipe because this one is not as rich in buttery flavor and less greasy. It still has generous amounts of butter, though! My family enjoys their cornbread spread with butter. In the future, I will be preparing these sweet cornbread muffins with a side of strawberry jelly, or different flavors of jams and preserves! Cornbread is often served during breakfast, lunch, or even dinner! It’s pretty versatile and my family absolutely loves it. Now that I’ve found a recipe that I actually like, I will start adding it into my meal plan and I know my family will be happy! Just recently, I served it with my Corn and Pepper Soup and it was a hit! I made this cornbread just like they made it at the Timberwood Grill. It was made in muffin tins so there was no need for slicing and serving. These individual cornbread muffins disappeared quickly in the restaurant as well as at home! This recipe makes 24 muffins so make sure to grease 2 muffin pans when preparing this mix! Grease 2 muffin tins well and set aside. In a large bowl, mix together the eggs, water, melted butter, and milk. Add in the cake mix and cornbread mix. Fill liners about 3/4 of the way full. It will make 24 muffins. Bake in preheated oven for 18-20 minutes. Check with a toothpick to see if done. Serve with butter or jelly.